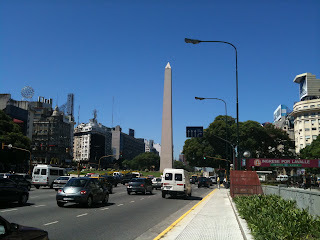 The Obelisco on Avenida 9 de Julio (9th of July Avenue) has been the symbol of Buenos Aires since 1936 when it was built to commemorate the 400th anniversary of the founding of the city. (The 9th of July is the independence day of Argentina.) In the new millenium, two important architectural works were donated to the city and have become the defining icons of modern Buenos Aires. One of these, the Floralis Genérica, is a steel and aluminum floral sculpture designed and donated by local architect, Eduardo Catalano. The petals open in the morning and close at sunset except on certain days of the year when it remains open all day long. The Floralis is in the Palermo neighborhood on Plaza Naciones Unidas at Avenida Figueroa Alcorta, next door to the public law school which is an architectural destination on its own with its imposing neoclassical façade.